All is set for the “Karvaan-e-Aman” that would be carrying over a dozen separatist leaders on their first ever visit to PoK and Pakistan when the Srinagar-Muzaffarabad bus rolls from here tomorrow morning. Should the corporate sector provide special education and facilities for SC/ST youth? Should foreign coaches be appointed for the Indian cricket team? 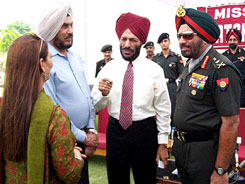 Mr Milkha Singh (centre) and G.S. Randhava with the Army chief, Gen J.J. Singh, and his wife during a function “Young Talent for Mission Olympics — Catch them Young”, in New Delhi on Wednesday. The Chief of Army Staff, General J.J. Singh, today said the Army had already launched an “in-house verification” of the charge made by former Pakistan Foreign Minister Gohar Ayub Khan that an Indian Brigadier had sold 1965 war plans to Pakistan for Rs 20,000. Buoyed by the Delhi High Court judgement in the Bofors pay-off case, the Congress today sought “an apology from those who launched a vilification campaign from position of power” against the late Prime Minister Rajiv Gandhi. The BJP today took exception to the judgement of the Delhi High Court quashing charges against Europe-based Hinduja brothers saying that it was a “glaring example of judicial burial of a corruption case” and alleged that it had been catalysed by “collusion” between the “powerful accused” and the CBI “pressurised” by the political executive. Even Indians do not deny that Hurriyat is an interested party. It stands to reason, therefore, that they should be allowed to meet with the leaders of Pakistan, the leaders of other side of Kashmir. The government is planning a moderate hike of Rs 1-1.50 per litre in petrol and diesel prices under a new scheme in which ONGC will be asked to bear part of the burden arising from increase in duties and spurt in global oil prices. Former Chief Justice of Punjab and Haryana High Court, Justice Ranjit Singh Narula, who carved out a niche for himself as crusader against violation of human rights, specially during the worst period of militancy in Punjab, died here today after a brief illness. He was 90. A day after there were celebrations in the Indian Air Force (IAF) over the success of its first-ever team in scaling the Mount Everest, there is grief in the force as a member of the three-member summit team Squadron Leader S.S. Chaithanya has been reported missing in the region after being caught in a severe blizzard.